What to wear on semi-formal occasions has always been difficult for men. What if a checked shirt and jeans was too casual and a suit and tie too formal? Women have always found it easier to pick the right look, but men struggle. In the UK a cravat used to be the solution if a tie was too formal. But in the 1960s it might be more Terry-Thomas than Errol Flynn. In the US the cravat was too British. From 1968 to 1974, there was the apache scarf. Remember Fred from Scooby Doo? The apache scarf had its origins in the cowboys's neckerchief. 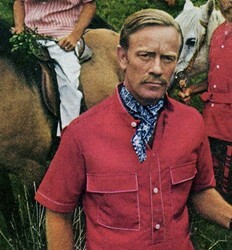 In the 1960s it met with bright paisley and swirling floral prints, and Italian or Indian silk. It was either a silk square or a long oblong cut on the diagonal. You tied it in a knot or fixed it with a ring called a scarf slide. For the lazy there was a ready-tied version. It was meant to look dashing, but could look camp. US adverts used the word 'rugged' copiously. The macho origins of the style were key. 1968 was the year of the apache scarf. Most upmarket men's stores in New York sold them. Whitehouse & Hardy sold Italian silk apache scarfs in vivid abstract prints for $4 in 1968 . They also sold a pre-tied version with an invisible clip for $6.30 . Bloomingdales men's store sold a silk square apache scarf by Jean Casanave for $8.50 also in 1968 . By 1970 boys could get them as well as men. The upmarket department store B Altman & Co advertised apache scarfs for boys who wanted the western hero look . By 1972 the craze had passed. This American style spread to the UK. 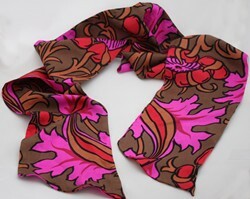 Austin Reed produced this floral apache scarf in the late 1960s. Apache scarfs were mainstream UK fashion by 1970. J D Williams also sold a floral print apache scarf for 17s 5d (87p) in 1970. On film you see an apache scarf worn by Peter the Dutchman (Tony Beckley) in 'Get Carter' (1971). Peter the Dutchman was camp, but Jack Regan (John Thaw) from the Sweeney was the opposite. He wore a apache scarf in 'Regan' (1974) and in 'The Placer' (1975) when he he went undercover as a bent lorry driver. Perhaps the choice was appropriate for a down-at-heel small-time crook desperately trying to look sophisticated. By 1975 the apache scarf was dead as a mens' fashion accessory.